After more than a decade in development, the finish line is finally in sight for the commercialization of wood fibre mat production at the BioComposites Group (BCG) plant in Drayton Valley, Alberta, ushering in a new era of wood-based bio-product manufacturing in North America. 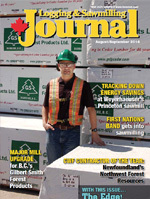 While the plant will only consume about two tonnes of wood fibre per hour, replication of the plant’s technology throughout the world and the premium price that customers are willing to pay for its wood fibre mats represent a potential new market from waste materials produced from North America’s forest industry. The BCG plant primarily manufactures resin-infused or non-infused wood fibre mat blanks that can be transformed using heat, pressure and moulds into products like automotive interior components such as dashboards and door panels. It is undergoing a certification process with several major auto component manufacturers and anticipates receiving its first purchase orders very soon. BCG is the first commercial spinoff launched from Tekle Technical Services (TTS). The privately-owned, fee-for-service R & D company, was established in 1998. TTS is headquartered in Edmonton and describes itself as an “incubator for fibre technologies.” Entrepreneur and wood scientist Tam Tekle is President and Chief Executive Officer. TTS is developing products in five areas: engineered fibre mats, structural insulated panels (SIPs), biocomposite panels, fibre-plastic composites, and fibre-cement composites. BCG is owned by Tekle and Dan Madlung, a former vice-president at forest company, Canfor. The BCG plant is the convergence of two business development dreams; it built upon research related to wood fibre mats conducted by Tekle at TTS. This is combined with Madlung’s belief in the business potential of commercialized wood fibre mat production technology that Canfor developed to produce fibre mats exclusively for automobile components, but mothballed about six years ago in New Westminster, B.C. Part of Madlung’s responsibilities with Canfor were to oversee operations at the fibre mat plant, which operated for about six years. The wood fibre mat production system being used by BCG can be described as a melding of technologies from both the wood product manufacturing and textiles industries, with the production line consisting of components from North America, Germany, France and Austria. The key component is the needler, which consists of 4000 barb needles that weave the short and long fibres together to create its strength properties. Tekle and Madlung are friends and were well-acquainted with each other from their work in the forest industry before forming their business partnership. Along with considerable provincial and federal government financial support, they purchased the idled Canfor fibre mat plant five years ago and moved it in 34 semi-trailer truckloads from New Westminster to Drayton Valley. For the past four years, they have been working to re-assemble the plant, learning from those with experience running the production line how to use the technology to its full potential. They are working toward certification from various automotive component manufacturers, with the goal of achieving commercial production. Once fully operational, the plant will employ 10 people per shift. He says TTS was initially hired by Canfor to provide consulting services to improve the line’s efficiency and to diversify the product line. 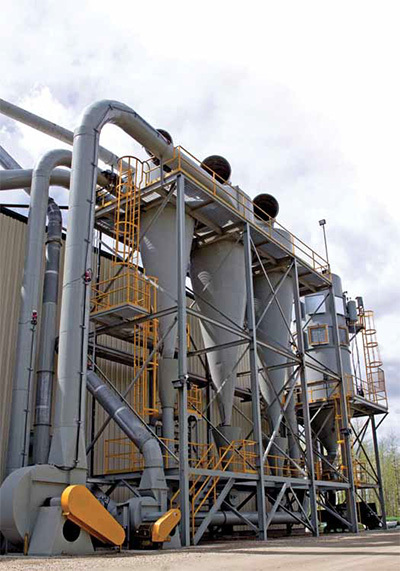 As part of the design of the BCG wood fibre mat plant in Drayton Valley, the company installed a top-of-the-line dust control system as a safety measure. 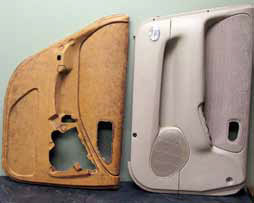 Wood fibre mats produced at the BCG plant in Drayton Valley can be moulded into car door panels (left) or dashboards that the auto industry says are 40 per cent lighter than current petroleum-based materials and 50 per cent cheaper to make. Madlung stresses that BCG is not manufacturing a commodity product like 2 X 4’s, but a very specifically engineered, high end building block for use by automotive component manufacturers. That’s why the plant must undergo a rigorous, meticulous certification process to ensure that it can deliver the quality and quantity of fibre mats needed by its customers. He adds that BCG could easily sell out the plant’s production because it is the only North American-based supplier of wood fibre mats to the auto industry. “One of our challenges is how big to grow with which companies, because our capacity is two tonnes per hour and their demand is much higher than that,” he says. 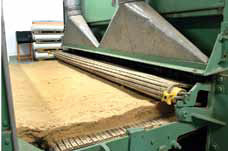 The wood fibre mats manufactured by BCG have potential applications in many industries. For example, BCG has already expanded its product offering to include both re-usable absorbent mats for use by the oil industry to remediate spills and as erosion control products, with grass seed imbedded within it. While it can integrate other fibres into its production stream, about 95 per cent of BCG’s natural fibres are wood-based. The refined SPF wood fibre that BCG is currently using to make wood fibre mats was supplied by West Fraser Timber from its Ranger Board medium density fibreboard (MDF) plant in Blue Ridge, Alberta. There are several companies in Europe producing wood-based automotive interior components for vehicles such as Audi’s, BMW’s and the Lexus brand—but the BCG plant is the only facility using its specific proprietary method to produce the building blocks for wood fibre components for automobiles in North America. Many of the world’s largest automotive component manufacturers, including Canadian-based Magna Interiors and Exteriors, have taken notice. BCG has a sales agency agreement with a company called Techstyles Inc. in Bingham Farms, Michigan to market its products to the auto component manufacturing industry. The reason why auto component manufacturers are excited about what BCG can produce is that their own research has shown that wood-fibre based interior components versus components from petroleum-based E-glass fibres are 40 per cent lighter and 50 per cent cheaper, as well as being biodegradable. Because of the need for greater fuel efficiency—being mandated for the auto industry by governments—component suppliers are also under considerable pressure to deliver lighter and greener components with equal or better performance characteristics. As the anchor tenant in Drayton Valley’s Bio-Mile industrial development, BCG’s goal now is to sell out the plant’s production and attract downstream businesses to the industrial park that can use its fibre mat blanks in a variety of applications, from automobile components to truck canopies to hot tub manufacturers. The product possesses a number of attractive features. 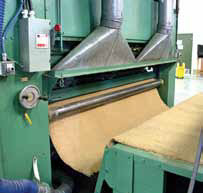 The cost competitiveness of the wood fibre mat as a substitute for petroleum-based materials, its comparable or superior performance in a variety of applications, and environmental friendliness have captured the attention of many industries looking for a comparable, greener alterative to what they are using now. The wood fibre arrives pre-processed at the plant with a target length of between 5/8” to 3/4” and moisture content of about eight per cent, either infused or non-infused with resin. Material from three separate lines creates the finished fibre mat product. The first line, which is the wood fibre line, is where the fibre is shredded and put into storage. During production, it is placed into an 8’ wide mat on the forming line of varying density and thickness, as required. A second line of organic or inorganic fibre, depending on the engineered specifications for the final fibre mat, is then created with the intention of placing one layer above the other prior to being mixed together. A third line is called a recycle line where material that doesn’t meet the specifications of either the first or second line is ground up and placed between the layers from lines one and two. The fibres are then mixed and they encounter a device called a needle puncher, consisting of 4000 barbed needles working at a specific speed and depth to weave the material together. “The material that comes out will look like felt material of a specific thickness and density, and then we just cut and package that material and ship it,” says Madlung. The wood sheet former at the front end of the production line was provided by COE Manufacturing Company, with the wood fibre breaker provided by Columbia Engineering Ltd. The wood fibre sargent picker was supplied by C.G. Sargent’s Corp, and the wood fibre bin was supplied by Lowell E. Pauli and Associates. Data Measurement Corp supplied a wood sheet radiation scanning gauge and a mat radiation scanning gauge. 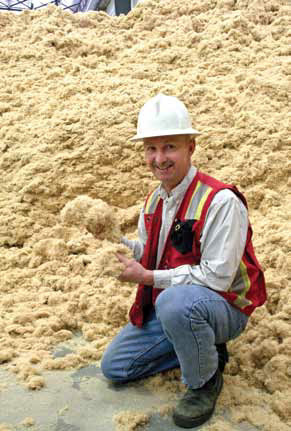 Dan Madlung co-owner of BCG and a former Canfor vice-president, has invested considerable time developing the wood fibre mat plant in Drayton Valley, including securing supplies of the raw material. This wood fibre was supplied by West Fraser Timber from its Ranger Board facility. Heading more toward the textile side of the production line, an Austrian company called DOA provided a number of components, including the textile fibre bale opener, fibre saw tooth opener, textile fibre sheet former, the main former for blending of wood and textile fibre, needler, mat cutting table and trim return sheet former. The mat cross cutting guillotine was provided by German company Autefa, and the mat trim openers and waste mat opener were provided by French company, Laroche. At the back end, Murray-Latta Machine Co. provided the mat stacking machine, and ACME supplied the mat unitizer. The equipment line is about 15 years old and when relocated to Drayton Valley, many of the components required reconditioning. Madlung says it was the ready availability of SPF fibre that encouraged BCG’s owners to relocate the plant to Drayton Valley, which has a long association with the forest industry. Weyerhaeuser operates a large sawmill in the community. He estimates that a greenfield wood fibre mat plant based on BCG’s technology would probably require an investment of between $15 million and $20 million. In 2009, the Alberta government—through its Community Development Trust funds administered by Alberta Innovates Bio Solutions through the former Alberta Forestry Research Institute, as well as Alberta Advanced Education and Technology—provided $4.5 million to help support research and development at TTS, with the goal of setting up the commercial facility in Drayton Valley. The funds were spent on site preparation, construction of a 32,000 square foot building, and refurbishment of equipment. In 2013, the Canadian government, through its Investments in Forest Industry Transformation (IFIT) program, contributed another $4.5 million toward commercializing the technology and establishing the BCG wood fibre mat plant. BCG is not pursuing patents at this time because once its technology and process is patented it becomes public knowledge. At this time, it has preferred to take the proprietary knowledge agreement approach with all its employees, consultants, and customers as a form of protection.